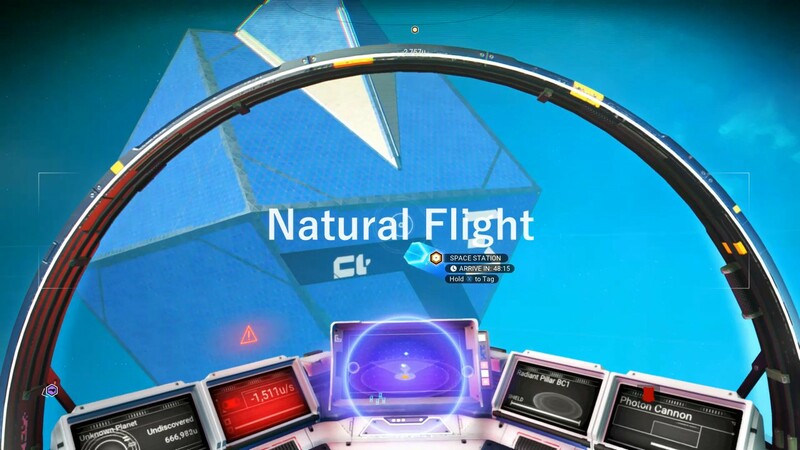 Natural Flight is an overhaul of the flight mechanics for No Man’s Sky. It changes it from the easy, arcade style flight to a more challenging simulation style of gameplay. I was aiming to modify the flight, docking and planetary landings to be more like the original Elite and Elite Frontier from the 1980s and 1990s. WARNING: Do not use this with Permadeath mode unless you try it out on a normal game save first, as it does increase the challenge of flying and docking, and increases damage with collisions. IT IS MUCH EASIER TO DIE. You can turn your ship to fire in any direction, while retaining your original trajectory. Reduced number of asteroids, but greater rewards from mining them. Asteroids are dangerous to collide with. You can initiate Pulse Jumps from within the high altitudes of a planets atmosphere, or closer to the space stations. Probably a few other small adjustments that I can’t recall at the moment. The current version will work with No Man’ Sky Visions 1.77. Drag the file “_NaturalFlight0.1.pak” into your No Man’s Sky mods folder. a) Removed some minor tweaks I had made to non-flight related matters, therefore removing the need for the inclusion of the following files, and improving compatibility with other mods. Thanks to chamile for the suggestion. b) Made docking slightly easier, as I often found myself unable to locate the “sweet spot” for the stations tractor beam. It’s still harder than vanilla.